PhD Norio Minato, President of NSWest Inc. The Worldfolio sits down with PhD. Norio Minato, Representative Director of NSWest Inc. to discuss the unique technology of his company, his plans for the future, and his desire to “create emotions” for end-consumers. For many years, the Japanese industry has been living on the Keiretsu model. In recent years, this model is being highly criticized. Many experts claim that this model will not survive in a globalized world. As a company that has been historically affiliated to Mazda, what is your analysis of these claims? After 2007, Mazda officially sold their shares of NS West, which meant that we were no longer dependant on them. What needs to be understood however is that Mazda will purchase the parts that show the highest quality combined with the best price. Therefore, the real question is: how do we stand out? In today’s globalized world, having high technological skills is not enough to be competitive. To remain competitive, we therefore focus on enhancing the dual-creation we enjoy with Mazda and Daihatsu. As we are familiar with Mazda’s philosophy, we are able to anticipate their desires. This approach and familiarity with a client is an example of co-creation. I believe this is how we stand out, and we shall continue doing so in the years to come. Can you give us a quick overview of NSWest? June 1st 2018 will mark our 31st anniversary. Since our creation, we have constructed two factories, one in Shobara, which began operations in 1962, and another one in Miyoshi, which started producing concave mirrors for HUD since March 2018. We also have a sales & development facility in Hiroshima City. Overall, our company is composed of 515 employees. NSWest started in 1967 as a branch of U-Shin Co., Ltd. which manufactured instrument clusters for automobiles. In 1982, the company renamed to YNS as it became a joint-venture between Nippon Seiki and U-Shin. In 1991, Mazda Corporation acquired a dominant share in the joint venture. In December 2007, Nippon Seiki bought out 100% of the shares and in 2010, YNS became NSWest. As a subsidiary of Nippon Seiki, we provide products to Mazda and NS’ clients which include Daihatsu but also to international corporations. Which are your core products and how do they contribute to your sales ratio? Our core products include meter display (place product picture). 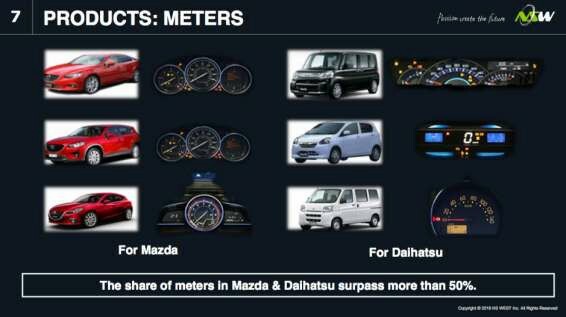 Our share of meters in Mazda’s and Daihatsu’s production of cars surpasses 50%, a strong result for an OEM. 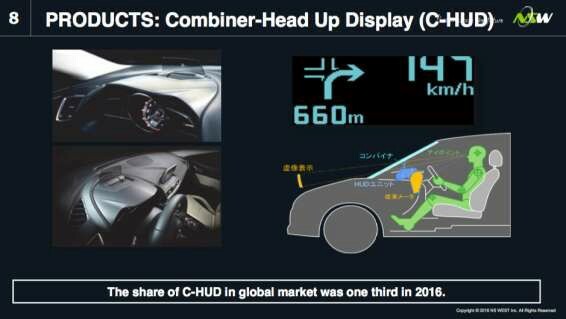 We also manufacture Combiner-Head Up Display (C-HUD) for which we have acquired a 33% share globally in the year of 2016. Can you tell us more about your unique in-house production model? Throughout the years, we have made great efforts to increase our in-house production ratio. We started by acquiring molding machinery before purchasing electronic and electrical devices and machinery that could assist us for PCB assembling. 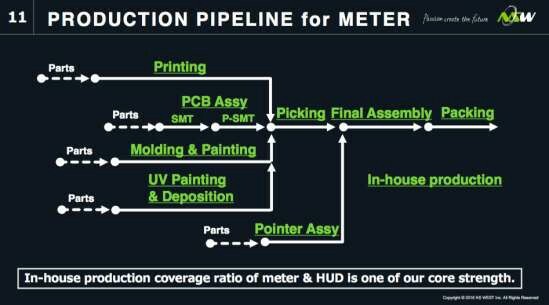 We also made investment in UV Painting and Deposition. Enhancing our in-house production ratio allows us to control and monitor the quality of our solutions and production cost improvements. 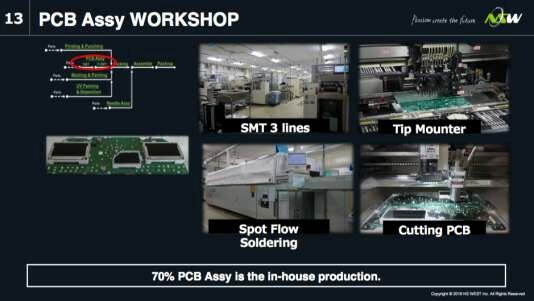 In our PCB assembly workshop, we can count on 3 SMT lines, Tip Mounter, Cutting PCB tools and Sport Flow Soldering Machinery. Overall 70% of our PCBs are assembled in-house. 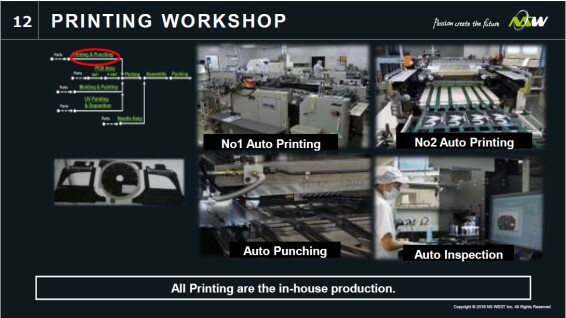 In terms of Printing, all activities are done in-house, beginning with Automatic Printing, Automatic Punching and Automatic Inspection. 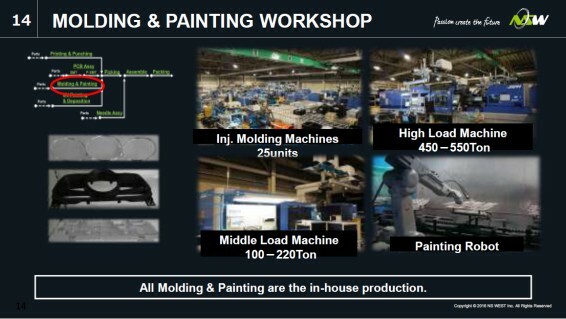 For injection molding, we utilize 25 injection molding machines, high load machines that can handles between 450 to 550 tons, as well as middle load machines and two painting robots. Once all the product’s components are produced, they pass by our final assemble workshop. 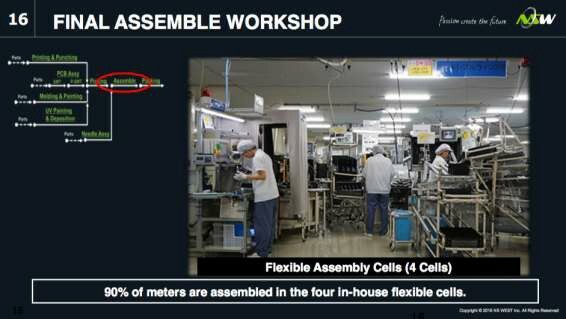 Thanks to our expertise, we have established four flexible assembly cells which allow us to assemble 90% of our meters in-house. Could you explain to us the philosophy, vision and mission of NSWest? Our management strategy is composed of Core Values and Brand Strategies, which are surrounded by 5 key pillars for innovation: Management, Business, Quality, Human Resource and Monozukuri. At NSWest, our first mission is to deliver emotion and security to our customers. We do not only manufacture products, but we contribute to the overall feeling that consumer have with their automotive. Secondly, we aim to enhance the satisfaction of our employees. Happy and fulfilled employees work harder and have an increased productivity. At last, we believe in contributing to the prosperity of our local community. Our vision is to become the number one Monozukuri company in the world. By “number one,” it is not scale that we are talking about, but rather overall quality, cost and delivery. Our aim is to create value that is over our customers’ expectation by reliably supplying our products and services to the world. Our values are divided in four sections. As we design and explain our corporate values, we always use the prefix “I” instead of “we” or “NSWest.” The point here is to place the employee at the center of the reflection. I encourage all our workers to think for themselves. Customer Focus: I will know my customers expectation and will to exceed his expectations. Challenge & Innovation: I will create my own vision, and I will challenge and innovate to realize this vision. Communication: I will initiate mutual conversation and I will create an open work environment. As a middle-sized enterprise, we have the change of enjoying a clear and effective communication between all members of the organization. Compliance: I will follow the compliance guideline and will make decisions conscientiously. What are the competitive advantages of NSWest? Our competitive advantages can be divided in five sections. Firstly, we put an extra emphasis on in-house technologies not only engineering but also manufacturing to attain unrivalled quality. Secondly, we are a mid-size company that is agile and efficient. Since we operate in a rapidly changing environment, this flexibility and agility allows us to navigate the many trends of the automotive industry. Thirdly, we enjoy and nurture a positive relationship with our customers. To attain this mutually beneficial relationship, we believe in the concept of “co-creation.” Thanks to our close relationship and communication, we are able to understand the needs of our clients and anticipate their demands. Fourthly is relationship with our employees. With regards to our workers, we believe in cocreation between employees and management. This close relationship allows us to be flexible and quick to react. At last, we nurture a trustful relationship with our parent company. By utilizing our mother corporation’s assets, such as their technological knowledge or overseas bases, we are able to leverage on the competitive advantages of a much larger firm; ultimately boosting our competitivity. For example, when Mazda or another end-client decides to produce locally for a given regional market, we sell our original designs to our mother company, which can then produce our technology overseas to best cater for our end-clients. What market trends do you monitor to remain a leader in your field? In our market, many external factors have been changing drastically. First, the market’s economy, politics and societies can quickly be transformed, which forces us to be weary of macro-economic changes. Second, we must be observant of our customers. In this regard, we keep a close look on their demands, prices and our branding in relationship to them. 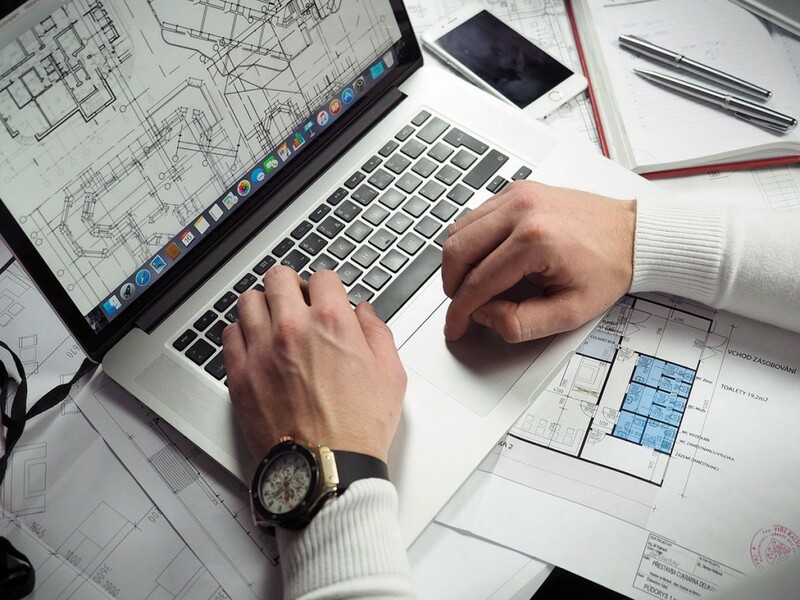 Thirdly, we closely monitor our business partners to analyze possible alternatives that may appear and to keep a keen eye on volume and pricing fluctuation. At last, we are at the forefront of technology, and we invest large amount of capital in remaining on top of the latest electronical, optical, software and manufacturing techniques. What actions have you taken to ensure the future of NSWest? The future of NSWest is in the HUD field. As this sector is living tremendous changes, such as increased connectivity, autonomous driving and electric vehicles, it is our duty to research new value in our products and to answer market trends. In this regard, we divide our business in three sections. One is our core business, such as head of display and meters. The second one is parts business, for which we have started the production of concave mirrors. In 2020, we will offer 1 million parts per year. I would like to extend the utilization of Third is new businesses, such as advanced display products, which are currently under development. In this new field, NSWest has the potential to be the first penguin; the one leading the group by taking risks but reaching for great reward. In terms of our Monozukuri, we are highly focused on reducing the lead-time and decreasing in-process stock to enhance productivity and lower manufacturing cost. For example, in 2014, our lead time for the production of PCBs was of 96 hours with an average in-house stock of 34 hours. 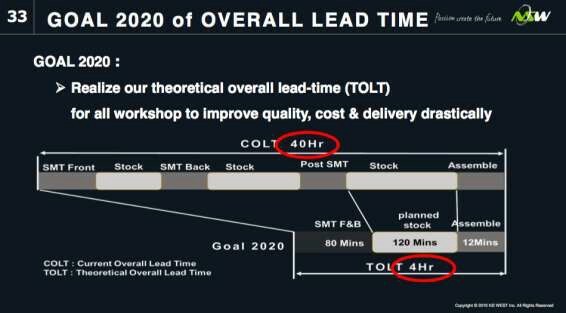 After June 2015, we successfully reduced the lead time to 27 hours and inhouse stock to 4 hours; a major accomplishment. Looking at the future, we aim to reduce our overall current lead-time (which includes all activities and sections of the manufacturing process) from 40 hours to 4 hours. This theoretical overall lead time will be our objective for 2020. Furthermore, we focus on having flexible assembly lines. Thanks to the adaptability of our production system, we are able to cater for the fluctuations in demand while never suffering from great losses. At last, we have made efforts to establish a branding factory. By keeping our facility clean, visually striking and inviting, we utilize our asset as a promotional tool. Could you expand on the “new businesses” segment in your mid term plan? Our core competences are our technologies. While it is important to continue developing and utilizing these technologies, we must not limit ourselves to automotive field. We are always trying to adapt our technologies to other segments and products. Three years ago, we formed a team of young engineers to constantly develop new products based on our unique technologies. In order to achieve this goal, we will need partners to support and assist us. It is essential to cultivate long lasting relationships with partners in order to create win-win situations. This concept of mutual assistance is extremely important to me. Here at NS West, we have many core competences. Since our partners have other competences we can combine our expertise to make revolutionary and unseen products. These synergies are the key to our future in order to tap into the “blue ocean market.” While I can’t explicitly tell you what innovative products we will be producing in the future, I can assure you that they will be innovative and reliable. Today, your two main partners are Daihatsu and Mazda. Looking at the future, whether it be for the automotive industry or your new businesses, are you looking for international partners, and what does a partner of choice look like to you? Absolutely! First of all, our parent company Nippon Seiki has many ODM’s whether it be in the United States, Europe or Asia. Naturally, as Nippon Seiki acquires a new business, we become their partners in that area. However, we can not over rely on our parent company for new businesses and we are constantly on the lookout for new partners. On the international scene, when large firms ally with Japanese corporations, there is always a scare of natural disasters, and this issue is something that is a major concern. To answer these claims, how would you reassure a potential partner or client? Here in Hiroshima, there are no risk of important earthquakes, no risks of tsunami and no atomic plants. We do have a bit of heavy rain but the bottom line is that we are in a very safe area. I’m always happy to show to people the history of natural disasters in our zone, for it reassures them. We are in one of the safest places in Japan! The automotive industry is currently going through tremendous changes. The rise of EV’s and autonomous vehicles are key examples of the shifts that industry is experiencing. What are your views concerning all these new trends in the sector? Honestly, this is a massive opportunity for us. Autonomous vehicles and EV’s need HMI devices, therefore representing an important potential market to tap into. The automotive industry is constantly growing and we need to adapt to the new demands of our clients. For a company that specialized in HMI, how do you envision the future of the industry? The challenge in today’s market is that the desires of every customer is different. While some customers want total control over their car, others want to sit down and be driven all the way to their destination. In the near future, the variation of HMI systems will explode. Each customer should be able to choose what kind of vehicle he wants to drive, and personalize it. You became president of NS West in 2012. If we were to have this interview again in 10 years, in 2028, where would you like to see your company and what legacy do you hope to leave at NSWest? The most important word for me is passion. We need to be passionate about what we do. Secondly, it is key to have a vision and to pursue this vision continuously. I always tell my employees that they need to have a vision – in order for them to see the road they need to take, and passion to create and achieve this vision. I myself am nothing without my employees and it is them who endlessly create innovative and reliable products. I encourage them to continue following their dreams and to never let go of the passion that animates NSWest.